When I posted photos of some of the dolls in my collection, a number of readers expressed interest is seeing some of the other dolls I have. I have between 20 - 25, most falling into the categories of "Barbie" or ethnic dolls, and yet I have never considered myself a doll collector. I wasn't a big fan of dolls as a kid, except for Barbie, so I'm not sure what inspired me to start picking up the occasional ethnic souvenir type dolls that I would find in thrift stores. I think I was intrigued by their clothes (what a surprise!) and also by the wide variation in facial expressions. I had also purchased a few dolls from Ebay, including an Elizabeth Taylor Barbie, and some of the "Dolls of the World" series, again because of the outfits. I set up a Flickr account several years ago as a place to show my photography and interact with other photographers, and occasionally I would participate in some of the doll and toy-themed photography projects, which led to the acquisition of more dolls, chosen specifically for their photo appeal. When I started my blog, I let my Flickr account lapse, but I came across some of the doll photos I had created for that forum, so I thought I'd share some of those with you, as well as those of some of my favourites that share my living space. 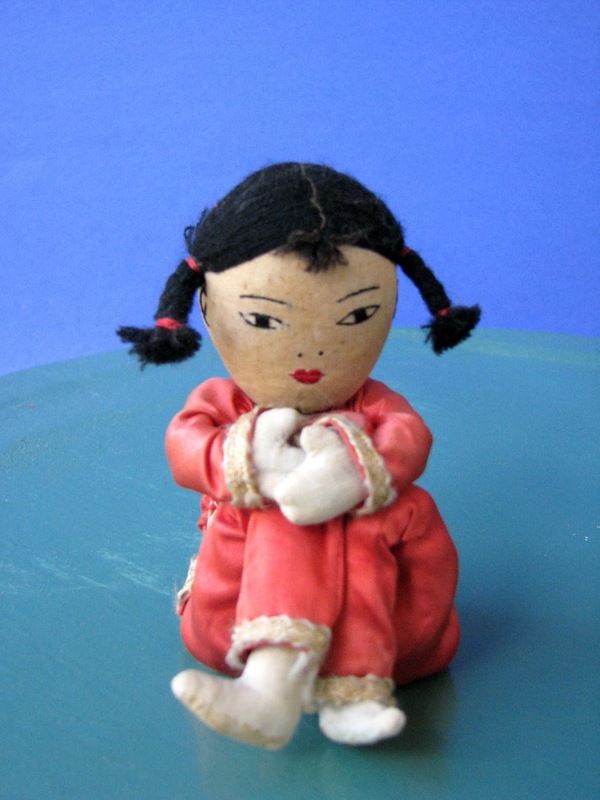 This was the first ethnic doll I ever owned - she is 4" tall, and was given to me when I was a little girl by a wealthy Great Aunt who brought her back from a trip to China. I rarely saw the Great Aunt, but I have kept her gift and even though she (she had a Chinese name but I don't remember what it was) is discoloured and frayed from age; she is one of the few items that remains from my childhood. One of two expensive dolls I own is a doll I purchased from one of the shows at Dollirium. She's just under a foot tall, made of polymer clay, and is named Beth (I don't usually name them) after her creator, Beth Robinson. There was something about her sweet yet creepy look that appealed to me, and she now hangs inside my front door, where she looks after the place while I'm gone. As you can see, she's not afraid to get into a scrap while on guard duty. 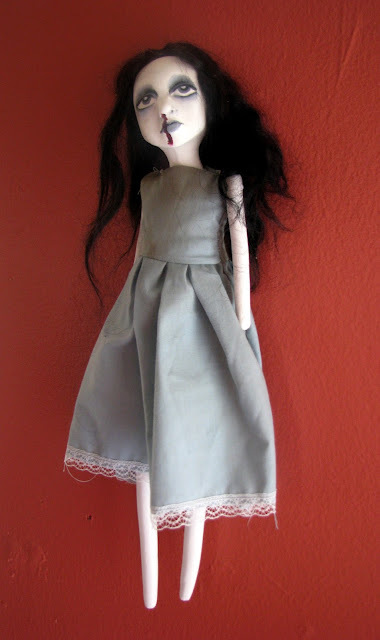 This is the other doll that cost me some bucks - a Japanese Pullip Doll named Lola. She was featured in a number of photographs in my Flickr page. For a while, she took on the role of my alter-ego in captioned photos like the one above. I used to spend countless hours with backdrops and lights shooting these types of photos and at the time it was a satisfying creative outlet for me. 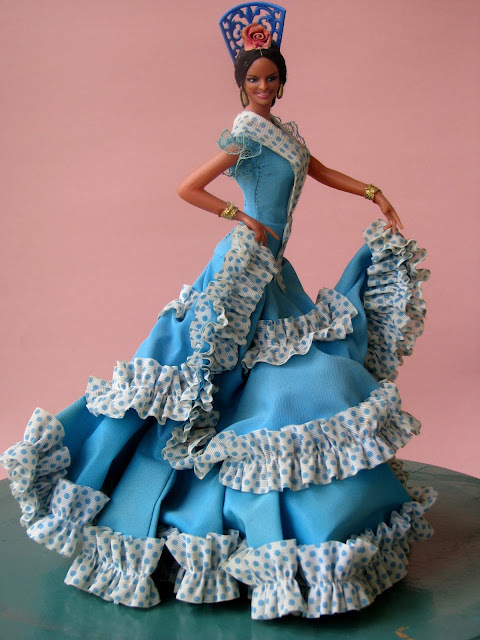 This saucy Flamenca, who is about 10" tall, is one of my favourite dolls. I took lessons in Spanish Flamenco dance for a couple of years, and was fascinated by the dresses and attitude of the professional dancers. When I saw this doll in her incredible dress on Ebay, I had to have her. I found this Geisha doll at a thrift store in my neighbourhood that seems to have a pipeline to some of the more interesting ethnic souvenir dolls I've ever seen. 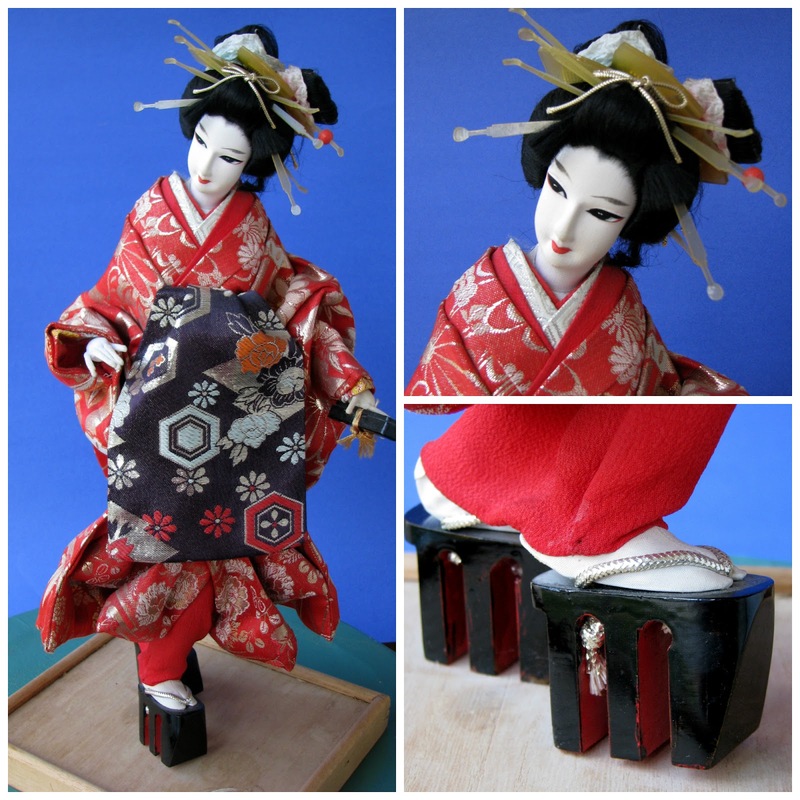 This one is about 14" high, and her outfit is beautifully detailed, from her elaborate wig, to her kimono and obi, and her traditional Geta shoes. She was made in Japan by Nishi and Co. 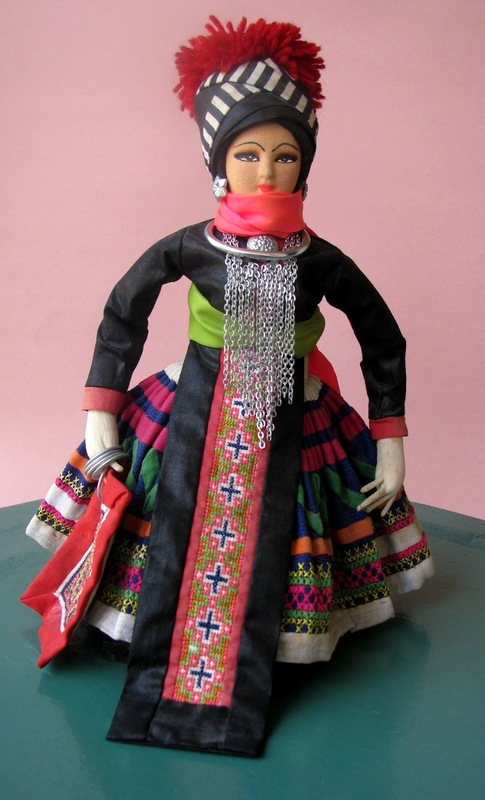 The only ethnic dolls I purchase are ones made in the country they are made to represent. This is another doll I found in the same thrift store as the one above. She is kneeling on a pedestal, and there is no indication of her country of origin, but I would guess somewhere in Eastern Europe. Again, she has a marvelously detailed costume, complete with a necklace that if it were human-size, would be part of my accessory collection. I had seen stuffed dolls depicting storybook characters like Red Riding Hood and the Wolf, where you turn the doll upside down, flip their skirt over and you have the second doll (a reader informed me they are called "Topsy Turvy" dolls), but I had never seen a politically incorrect version until I found this one at Value Village. As they are both wearing the clothing and head wrap of a typical "Black Mammy" character, it doesn't seem like they are meant to be a Plantation owner's wife/slave combination. 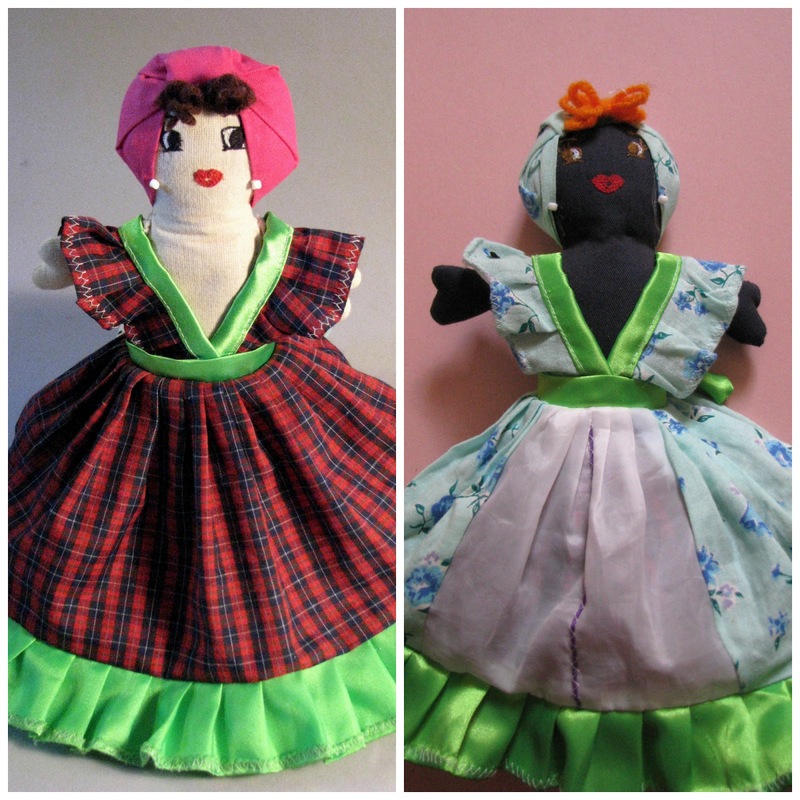 The doll on the left is from Cuba and I'm not certain of the origin of the paper one on the right. Most likely it was a Latin American country because of the skin colour and outfit. Someone put a lot of time and care into her creation - she is made entirely of heavy paper (except for her face) that has been folded and sculpted with great skill. I like to think that I have rescued these dolls from their thrift-store abandonment, and provided them with an opportunity to live happily surrounded by kindred spirits (which is what we all want, is it not?). 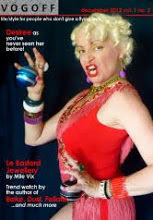 If you want to see more of my pre-blog photography, (including cats, Las Vegas, Paris, and Roller Derby!) you can find my Flickr page here. wow you have some nice ones. I had one of those 2 in 1 dolls as a child. I think it was from a story ,but I can't remember. And I don't know what became of it. Such a cool assortment of unique dolls. A fun item to collect. I loved the photos you created with the barbies too. We must be kindred spirits! I too have started rescuing dolls from the thrift shop and shopgoodwill.com. 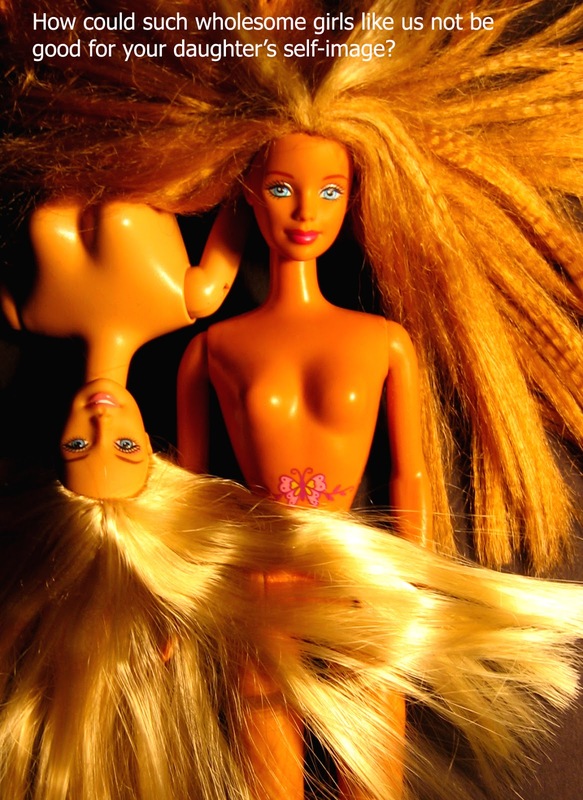 The Barbies sometimes make appearances in my specialty posts. Madame Alexanders are featured regularly, I'm drawn to their never-changing expressions. I rarely find dolls in the thrift shops of the quality that you showcase. The dolls that you turn upside down are called topsy turvys - you don't find many of those nowdays. What fun! I love the old Barbies, although I only had a Midge, who eventually got worn out and ruined. We also had a topsy turvy doll that was given to us by a neighbor. She eventually went to my niece and got worn out and ruined. I love your little Chinese doll, and also Beth. What a wonderful collection you have, Shelley. I was very much a doll lover as a child, but just didn't have that many, although I played a lot with the few I had. The Chinese doll from your Great Aunt is so sweet, with her serious little face, and it's unusual to see a sitting down, legs crossed doll. Lola could take lessons from her, but that would be a shame, she's fine as she is! I love the set ups you created with the captions, look at Woody copping a feel! The costumes and the detail are incredible, aren't they? I can see why you were drawn to the flamenco dancer with her beautiful dress, and the Eastern European and Japanese doll clothing is so intricate and perfect. I love your doll collection. Bizarrely, when I was in primary school I was in a dancing group, and our costumes were like those topsy-turvy dolls. 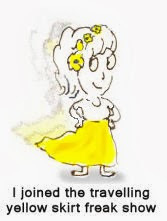 We had long gathered skirts, and at the end we would hold them above our heads like a can-can dancer, and there was a black woman appliqued on the skirt lining. Talk about politically incorrect! Any teacher who made kids do that today would be sacked. These dolls are amazing-- thank you for sharing this! I found a two in one doll on a trip in the Caribbean, though one side was male and the other female! A gorgeous collection. What a wonderful collection!! Thanks for sharing these with us!! I'm off to check out your Flckr! 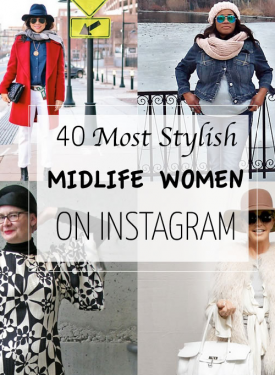 This post rocks as does your doll collection. Beth and Lola are two of my favorites because their sadness speaks to me. The Flamenco dancer is a real beauty and I love that your ethnic dolls are from the place that the doll is depicting. Your dolls and the way your describe them is also like you are sharing a bit about yourself and I love that! I have a few myself and they make me pretty friggin happy to look at! Shelley, I didn't know that you had a doll collection. You're going to need a 'doll room' if this continues! Your photos are beautiful, as always, and I enjoyed the diversity of the dolls that share your space and protect you when you're not at home. I like the concept! I didn't know you love dolls so much, if i see an interesting one i will get it for you! 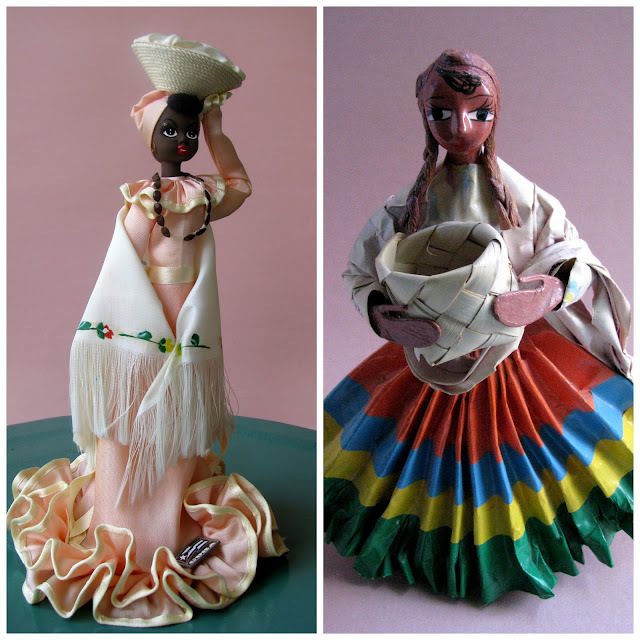 I love the gorgeous first little Chinese doll and the fabulous flamenco lady in her spectacular dress! 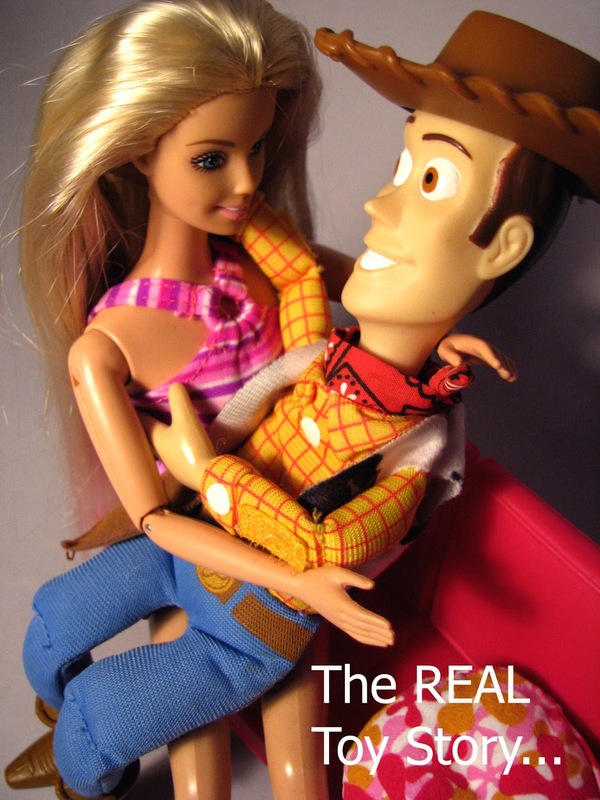 And Barbie and Woody are fabulous!